Sunshine fans rejoice! It’s time to get out from under the doona, into the fresh Spring air and draw a few deep breaths. Yes, Spring has sprung. 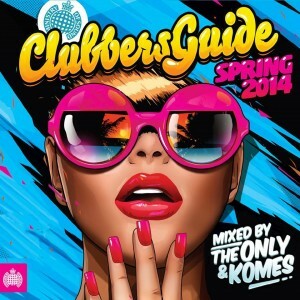 And as always, the team at Ministry Of Sound has your soundtrack covered, with one of their biggest annual releases… the ‘Clubbers Guide To Spring’. The 2014 edition of the evergreen compilation lands today, delivering 46 stonking club anthems that will have you invigorated and ready to shake that tush right through ’til summer and beyond. It’s been ably guided by The Only and Komes and comprises a host of big names (see : Duke Dumont, Timmy Trumpet, Uberjak’d, Coldplay, Hardwell, Will Sparks, Cedric Gervais etc) sitting pretty alongside some of the season’s biggest club anthems (current club No.1 ‘Firefly’, current club No.2 ‘Won’t Look Back’, current club No.3 ‘Blur’… you see where we’re going with this). And to celebrate its release, the lovely folks at Ministry have gifted us five copies to give away to you. This week, the giveaway is a three step process! 01. Shoot through an email to us containing your name and postal address. 03. Answer this little question… Which female vocalist features on the new Hardwell single? (Clue… it was in our midweek news wrap!). Do all that and we’ll pop you into the draw to win one! The competition will close at 10:00pm AEST on Friday September 19, 2014. Only one entry per residence and email address will be accepted. Open to Australian entries only. Winners drawn entirely at random. Winners’ first names, suburbs/towns and states will be published on the site on Saturday September 20, 2014. Five sprightly Spring-lovers will each receive a copy of the sensational new Ministry Of Sound compile, ‘Clubbers Guide To Spring 2014’, with thanks to our friends at Ministry Of Sound. And don’t forget, we’re not planning on sharing your details. Nor concocting any other scheme, evil or otherwise. It ain’t our schtick.